My dad on the fishing boat. 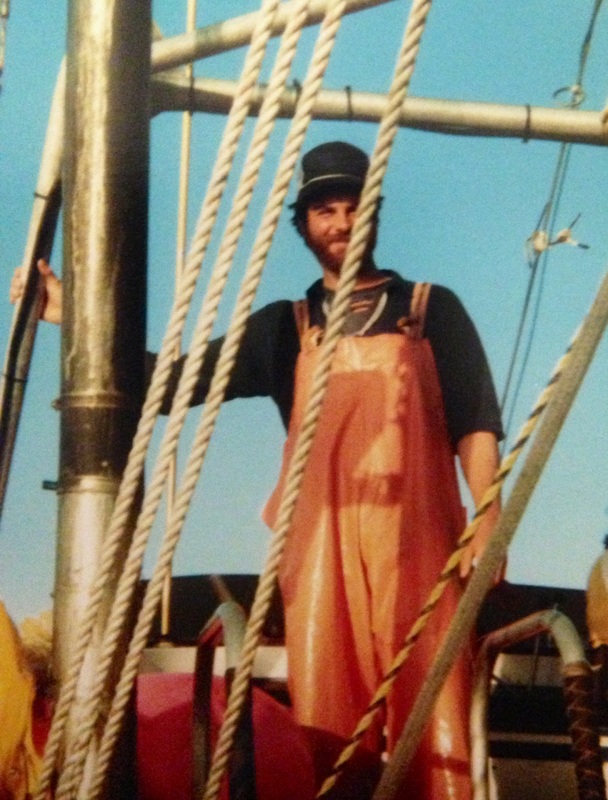 When I was a little girl my dad worked every summer as a commercial fisherman in Alaska. He’d be gone for three months, and return with a full beard, a few presents, and the extra money we relied on to get through one more year on the salaries of a part time ESL teacher and a home day care provider with two small kids. I’m sure I missed him. My dad was such a fixture in my day to day life throughout the year that suddenly having three months without him must have been difficult. There was no Skype back then, no email, he would write us letters, a few of which have survived. I do remember, or think I remember, going to pick him up at the airport on his return. It was always a bit of an event. 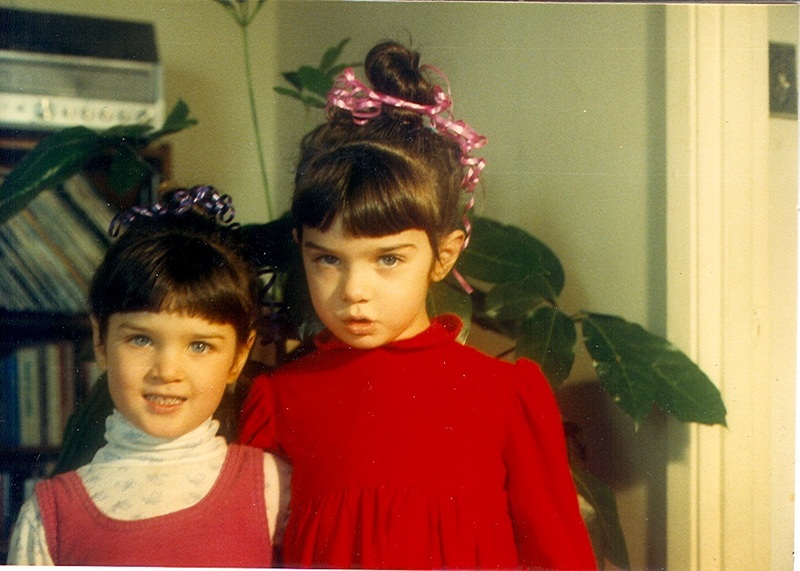 With my sister and I in new dresses or hats (the hats were once famously were left on the roof of the car as we drove away from the airport and lost forever.) And this being the age before super-sized airport security, it was also back when you could go all the way to the gate and wait with baited breath for the passengers to deplane, craning your neck and jumping up and down to try and catch sight of the one you were waiting for. The summer when I was four years old, my dad brought me a stuffed beluga whale back from his annual Alaska trip. I loved Raffi music, especially the song “baby beluga”, so it was an appropriate gift. The whale was a simple design with a satin lined open mouth, a stitched black eye, two fins and a tail. The whale was as long as I was tall and the story goes that when he presented it to me in the airport I wrapped both arms around her and pressed my face into her soft side, absolutely enraptured with her sudden presence in my life. I named her Whaldy. I was in a very literal phase in the naming of my toys. Me sleeping with Whaldy and my other toys. Whaldy went everywhere with me. I slept with her every night, she was perfect for sleeping with, being about the size and shape of a four year old body pillow with fins. When we started the yearly flights to and from Japan, Whaldy would fly too. She was too big to fit in a suitcase, so the first few years I carried her through the airport, or used one of my stretchy headbands as a belt to attach her to my side. Later my mom made a special carry-on bag for me. It was like a duffel bag, the perfect size for Whaldy to ride in, and lined with pockets for all my books and games and snacks. My dad was pretty fond of Whaldy too, he would often borrow her and take a nap on the floor with my whale for a pillow. When I was in college, my mom found a stuffed orca whale and got it suggesting I might want to give it to my dad so he’d finally have his own whale to sleep with. But the orca, while large and lovely and plush, wasn’t structured in quite the same body pillow like proportions, and so I just kept her, and let her and Whaldy hang out together on top of my dresser. 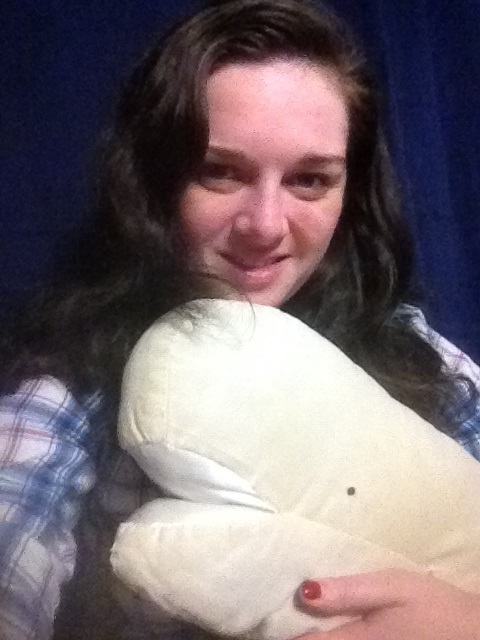 As I grew up I would sometimes pretend to be an adult and not sleep with my whale anymore, especially If I had company. I would move Whaldy off the bed and pretend that she always stayed on the dresser with the orca, looking on. 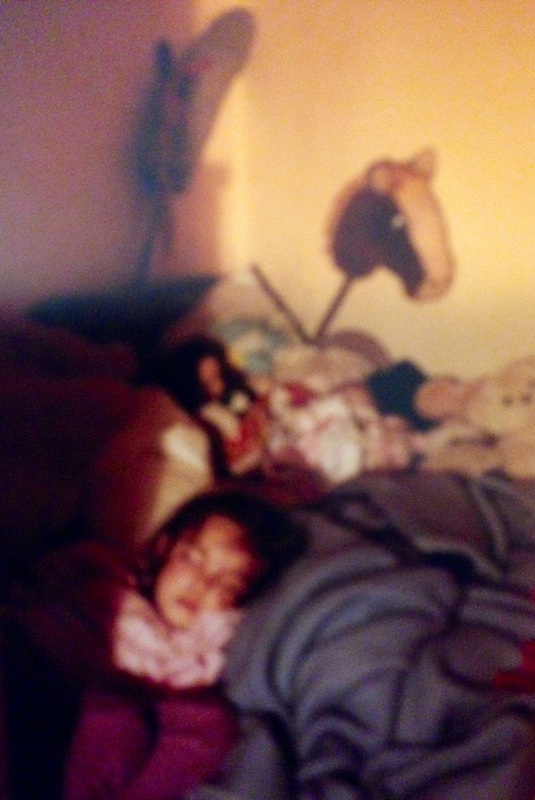 After all, it was silly to still take a stuffed animal to bed, and I could sleep just fine without her, so she’d often stay on the dresser for months at a time. The day my dad died I came home to an empty house. My roommates and I were in the middle of moving, and they had already started sleeping at the new place. I was a numb, slow moving, shadow of a human being. I’d spent the day moving from one room of my dad and stepmom’s house to another, drinking water whenever anyone gave it to me and trying to come to terms with this being my life. I thought I might go spend the night with my sister, but once I got home I couldn’t face leaving again, not even to drive what amounted to around the corner and climb the stairs to her apartment. Instead I took Whaldy off the dresser, wrapped by arms around her, pressed my face into her side and cried until I fell asleep. I didn’t sleep well that first night, but it was only by holding tightly to the stuffed whale that had been by my side for the last twenty eight years, that I managed to sleep at all. 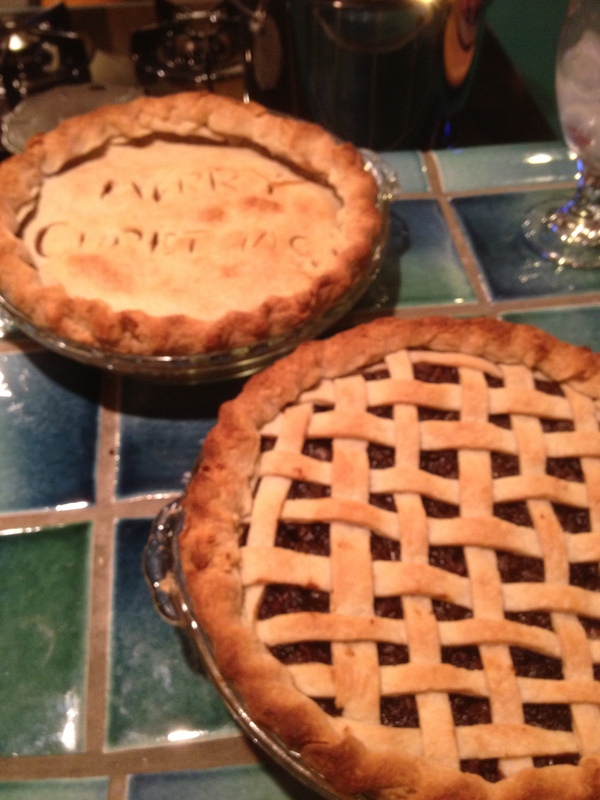 Every year for Christmas there were two pies: apple and mincemeat. The mincemeat pie was for my dad. It was dark and fragrant and smelled of spices and alcohol; it had a beautiful lattice top crust that my mother would intricately braid. The apple pie was for everyone else. When I got a little older I started to try the mincemeat pie, I’d take tiny slices and only eat enough to get a good crust to filling ratio, I had to have crust in every bite and when it was used up there would be a pile of discarded mincemeat on the plate. When I was growing up, the mincemeat came in jars, and was spooned into the pie crust unadorned. I remember one year when I was very small that my mother had somehow forgotten to get it, and me and my dad went on a pilgrimage, circling further and further out to try and find a store that was open. Back in the early eighties in Seattle this was a tall order on Christmas Eve. All the big grocery stores were closed up tight, and the occasional gas station mini marts we found had lights on, but nothing so exotic as mincemeat. My little sister and I, in our Christmas outfits. During the Japan years the mincemeat had to be special ordered from the States, or purchased at the tiny international grocery store that took two train rides to get to, and charged ridiculous prices for such luxuries as peppermint tea and refried beans. After the divorce, I took over the sacred duty of making these pies. I would craft the apple with its abundance of cinnamon and nutmeg, use tapioca instead of cornstarch to avoid sogginess, and carve “Merry Christmas” into a top crust with a generous crimped edge. I would find jars of mincemeat and carefully braid the lattice top the way my mom had taught me. One year it snowed in Seattle, 2008, I believe. The city froze over, buses ran hours behind schedule, ambitious cars slipped and skidded trying to make it up Seattle’s ice covered hills. And I confidently put on my roommate’s hiking boots and tramped the half hour walk to Whole Foods to buy mincemeat for Christmas. Only that year there wasn’t any. And there wasn’t any at QFC or Safeway or Met Market. I was told everywhere that they stopped carrying it, and so I decided that I would simply make my own. This proved harder than anticipated. Every recipe I found online called for “a jar of mincemeat” as its first ingredient, and then followed with ideas of how to make it better with nuts and butter and extra apples. The other recipes were for the older English version from which the Christmas confection evolved and the first ingredient listed was ground beef. I turned next to my old friend, The Joy of Cooking, where sure enough there was a recipe for “Mock Mince Pie”. The ingredients looked nothing like I thought they should but I’d never been entirely sure what mincemeat consisted of so I gamely cooked up a batch. The results were akin to a spicy applesauce studded with a few lonely raisins. There was no mincemeat pie that Christmas. The next year I returned to the internet and dug down further until I finally found a recipe that looked plausible. I went to several different grocery stores to track down all the kinds of dried fruit and candied peel it called for. I went to the liquor store to buy cheap rum and brandy. I used butter instead of suet, and at the end of it all I had a pie worthy pot of mincemeat and the whole house smelled like Christmas. 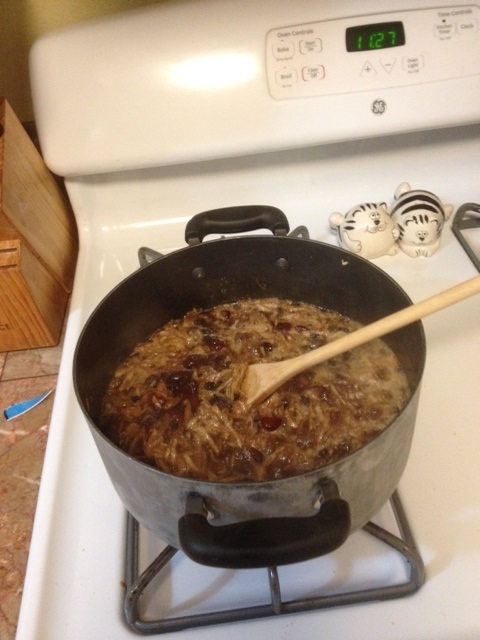 The mincemeat on the stove. When I found the mincemeat recipe online I wrote it down on the back of an envelope that had once held a medical bill. For several years this floated among my piles of cookbooks and I managed to find it again every year. I never followed it exactly, but I liked having it there, guiding me as I threw piles of raisins and brown sugar and rum into the pot. Somehow, after lasting so many years, my mincemeat envelope didn’t survive my recent move to Bothell. After tearing apart all the cookbooks last night, I tried to find it again online. It wasn’t there, but I found one that looked to be along the same lines, and I pretty much have the thing memorized at this point. Right now my mincemeat is cooling on the stove, ready for tomorrow. Because it wouldn’t be Christmas without this pie, even if I’m the only one who eats it this year. My dad loved mincemeat because his mom, a native New Englander, had made it part of every Christmas, and he managed to pass his love of mincemeat on to me. Perhaps in the years to come my nephew, my step nephews and nieces (who currently claim to not like any pie and only eat the ice cream), and perhaps even one day my far off future children will take small slices and eat only bites with sufficient crust, leaving discarded piles of mincemeat on their plates. Unlike other holidays, Thanksgiving serves no purpose other than the making and sharing of food. There are no gifts exchanged, no mass attended. The only ritual, the most important ritual, is to be close to those you love and to eat too much. It’s a holiday that doesn’t divide very well, it’s possible to do a sort of pub crawl among several different dinners, but I’ve always felt that misses the point. Better to pick one table and fully commit. I learned this lesson the first Thanksgiving after my parents divorced. That happened the summer I was twenty, going into my junior year at Cornish College for the Arts. It was the first genuinely terrible thing that had happened in my life, my first great loss. That year at Thanksgiving, all four members of my family arranged to be out of the city. We didn’t talk about it, but somehow my mom, my dad, my sister and I each managed to line up trips or visits that had us outside of Seattle on Thanksgiving day, away from our broken family table. I went to New York City and stayed with my friend Catherine who was doing a special semester of college there. I wandered the freezing streets in my flimsy little Seattle scarf, going to the bars Catherine had pre-screened as having lax carding policies and visiting museums. On Thanksgiving day we went to a French/Asian fusion restaurant in Brooklyn with a group of her friends, and I ate Tempura Soba and drank white wine. The following year we tried to have it both ways. My sister and I ate lunch with our mom at Cosca’s on the Ave, and then went to our dad’s house for dinner. He’d prepared it the way he did most of his cooking those first years after the divorce-by using the PCC deli to its full advantage. The food was pretty good, but none of us was really in the mood to celebrate, and he’d mistakenly grabbed the vegan pumpkin pie, which was neither sweet or spicy enough, and tasted distractingly like tofu. By the third year my dad had begun dating Sonia, and the whole family had figured out that the only way to deal with Thanksgiving was to alternate, with each parent getting us every other year. 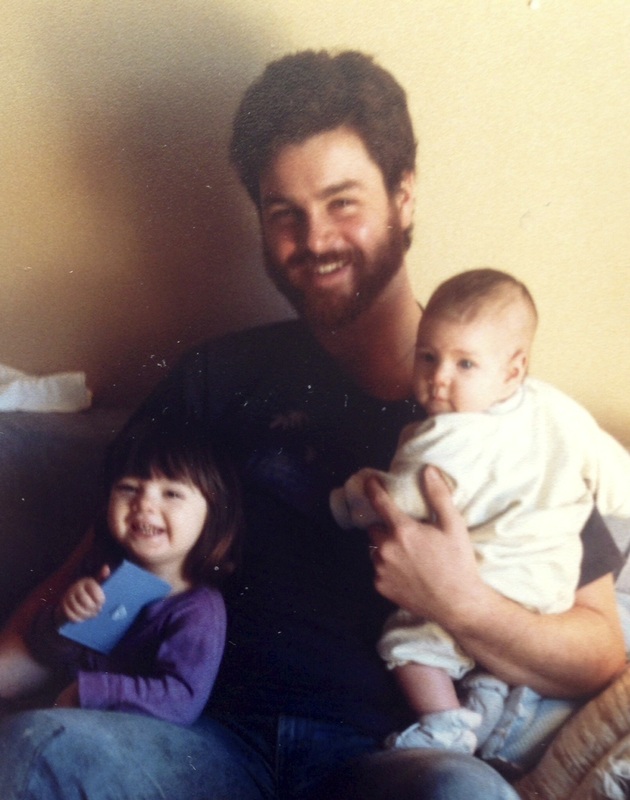 I had graduated college and was house-sitting for my friend Elizabeth, who had gone down to Oregon for the holiday. I had agreed to go up to Sonia’s for Thanksgiving, despite only having met her once, briefly, and having giant emotional reservations about my dad having a girlfriend. I brought a pie, homemade and perfectly seasoned and set out to Lynwood determined to get through the night in one piece. I’ve been a fish eating vegetarian since I was eight years old, but somehow this crucial piece of information had not been communicated to everyone cooking the food. So of course, the salad had bacon in it, the stuffing was prepared with chicken broth, and the things I could eat were alien dishes that had never before graced my Thanksgiving table. Things like Jello and green bean casserole. I pushed some mashed potatoes around my plate and made small talk, then I escaped back the house that wasn’t even mine where I ordered a pizza and called my mother. I broke down in tears as I relayed to her the ordeal I had suffered through, and lamented the general unfairness of everything. “And I LIKE her!” I wailed into the phone, this seeming like the ultimate cherry topper of unfairness, that in spite of everything I genuinely enjoyed the company of the woman who would later become my Stepmother. 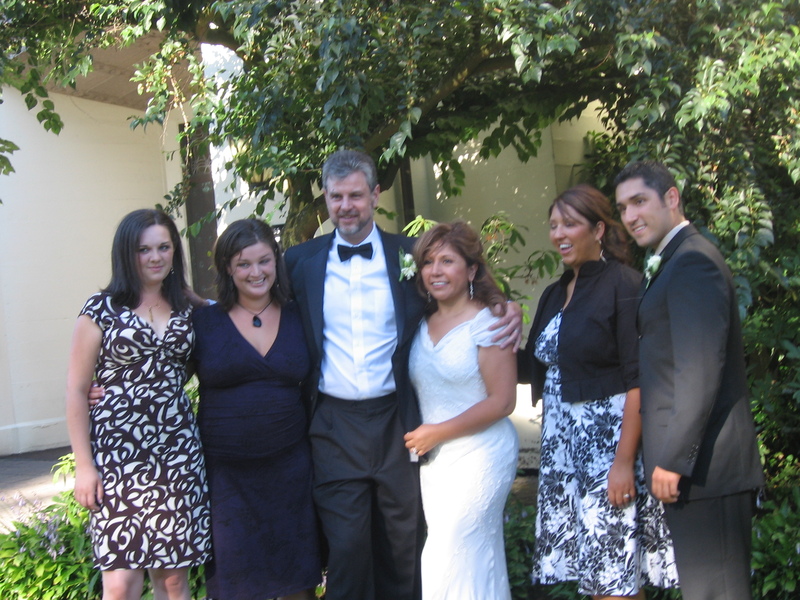 My dad and Sonia’s Wedding: me, my sister, my dad, my stepmother, my stepsister and my stepbrother. Thanksgiving in the years since has been a marked improvement. When it was Dad and Sonia’s year I could count on a piece of salmon just for me, and I began to look forward to the green bean casserole, especially once my stepsister’s husband began making it with fresh green beans and homemade roux. 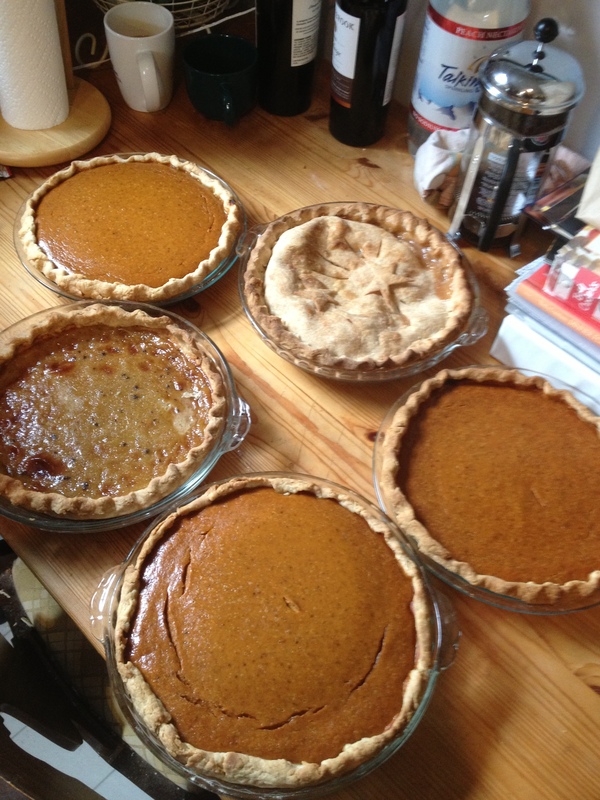 I still brought pie, the usual pumpkin and one or two new ideas, attempts at pecan, or maple nutmeg custard. I continued to enjoy Sonia’s company, and loved my new, ever expanding family, my new rituals. This year will be the first Thanksgiving since my dad passed, and as luck would have it, it’s his year. I was tempted to leave the city again, to run off to Canada for the weekend, or spend all day hiding in my room, or at a bar. But I’m not doing that. I’m going to go and have dinner with Sonia, and my sister, stepbrother and stepsister, and their spouses and children. I got up early so I could bake three pies before my roommate needed the oven for turkey. This year I made pumpkin, sour cream apple, and a new recipe I found for a cranberry/almond/caramel tart. I’m doing this because in spite of the great losses we have suffered, we are still family, and we are still very capable of making and eating good food. 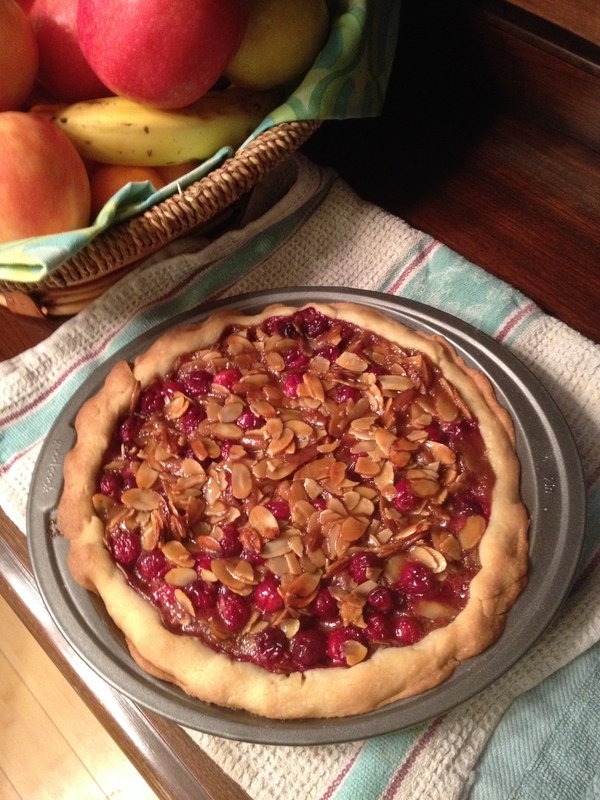 my cranberry, almond, caramel tart. 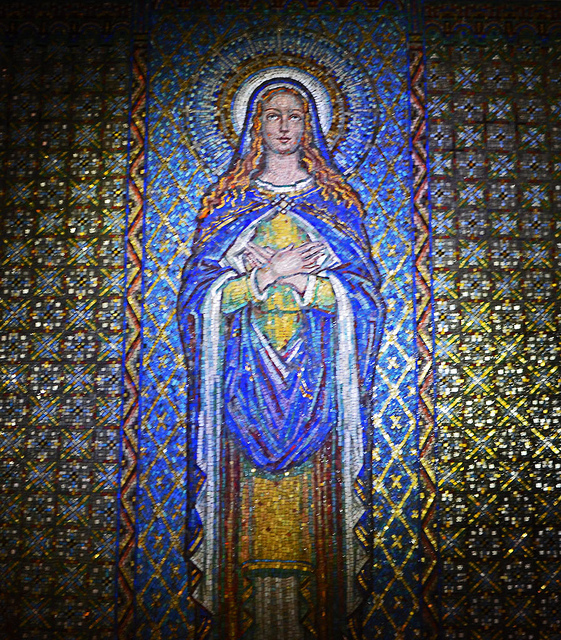 My stepmother emailed me and my sister earlier this week, to check in on us, and she said she is determined to get through this holiday season “with gratitude, rather than despair.” It’s a mantra I will try and return to over and over as we move forward into through Thanksgiving into Advent and Christmas. I will try with everything I have to stay focused on gratitude. To remember the many good years we had together, to toast his memory. I am grateful, I had thirty two years of having a fantastic relationship with my dad, it’s a gift I don’t take for granted. 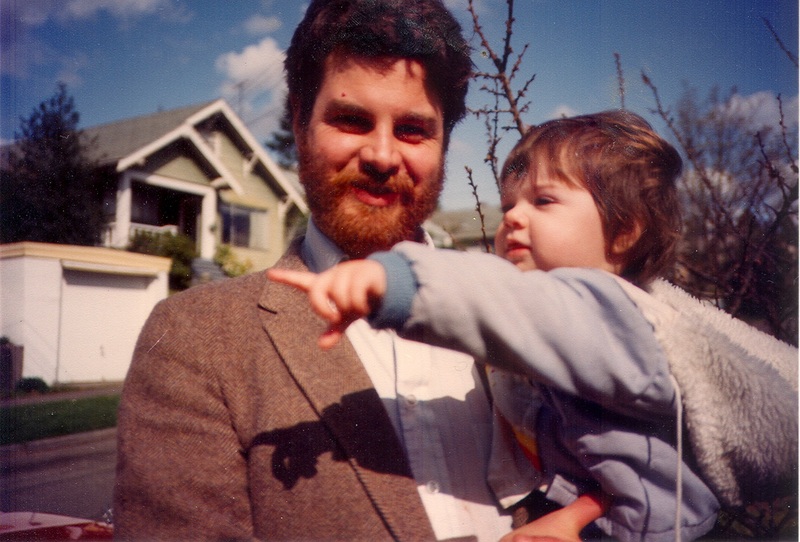 Me at around a year old, with my dad. When I was a baby, one of the only ways to get me sleep was to drive me in the car. At least that’s how the story goes. My dad said he would take me in the truck and drive the long circle of 35th to Sand Point Way and back around to 90th. If I wasn’t asleep when he came back to the house he’d make the loop again. 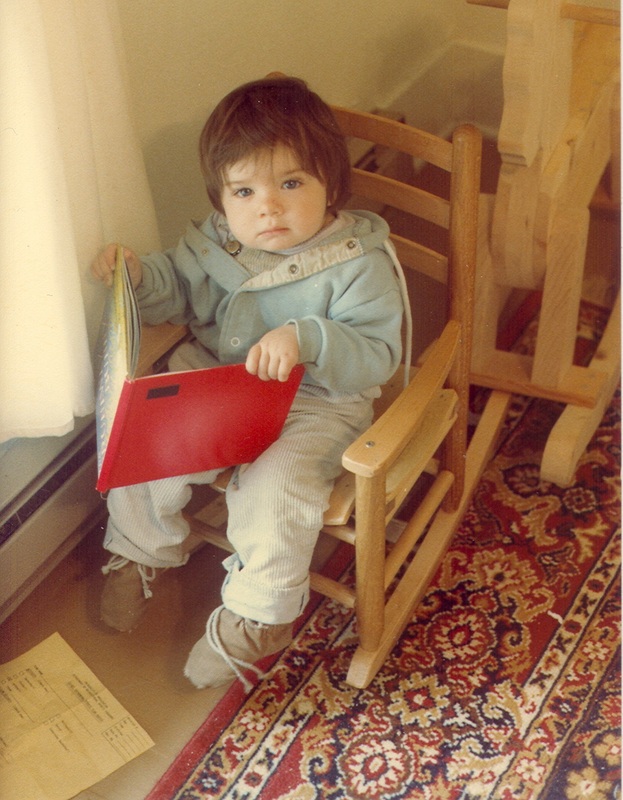 It was a treacherous way to get a baby to sleep, especially as this was the early 80’s, before detachable car seats, when the whole endeavor could unravel if I woke back up while being moved from the car to the bed. I, of course have no memory of this, but I know the route. I’ve had the early Seattle houses where I lived pointed out to me by both my parents: the apartment on 15th just off University Avenue where I was born, the married student housing near U Village where my sister was, and the Wedgewood house we moved to next. This one I do have memories of, it was up the street from a Catholic school with a playground we dubbed “The wiggly bridge”. When I was just past the age of needing to be driven to sleep, my dad and I would walk down there in the evenings, stopping at the tree by the parish residence to construct “cakes” out of leaves and grass. I don’t know if the driving bedtime rituals were the inspiration behind the story of “Maitlin and the Moon” but it’s hard to imagine they were completely unrelated. “Maitlin and the Moon” was the first in a long, long, series of bedtime stories that my dad told me and my sister nearly every night for years and years. It was the only one I remember being repeated more than once, and the only one in which my sister’s alias, Balin, was not present. Once Balin came on the scene the stories changed nightly, the ongoing adventures of Maitlin and Balin lasting through at least two more houses. The only one of the later stories I remember details of was the one he told to prepare us for the move to Japan. In this story, Maitlin and Balin take a ship to a faraway land inhabited by people with straight black hair and white teeth. I think there may have also been more than one featuring adults slipping on banana peels, during a phase where my sister and I considered this to be the height of comedy. Because this was my reality growing up, I didn’t realize until much later how absolutely remarkable the ritual was. 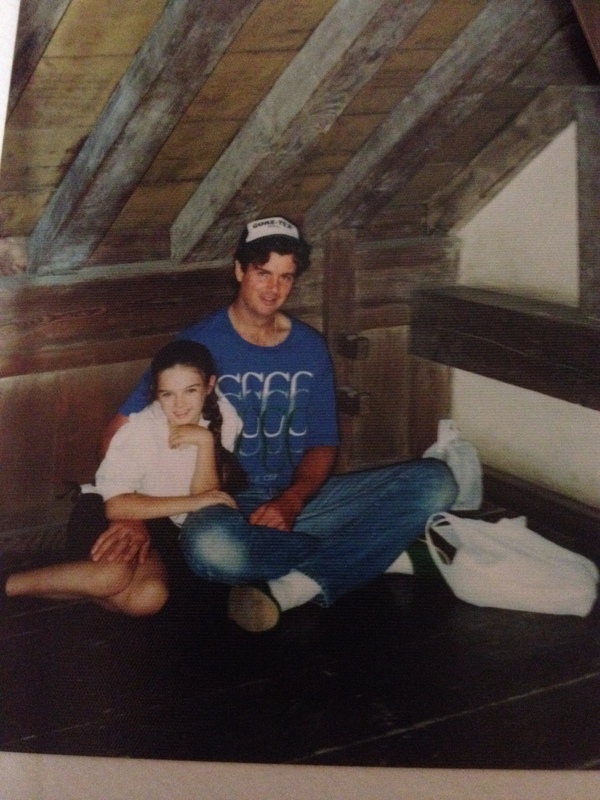 To have a father who not only sat with his daughters every night when they went to sleep, first between our two futons, and later in the narrow hallway between our separate rooms, but sat there telling original stories night after night, about two little girls with slightly more exciting lives, but with names that rhymed with ours. My sister, my dad, and me on the porch of the Ballard house. I know at some point my dad wrote this story down, but I can’t find it, so this is my best recollection of how it went. I think that sometimes he made it longer by having the trip to the moon and back repeated several times before the curtains were closed all the way. One night when Maitlin’s dad put her to sleep during the full moon, he closed the curtains, but not all the way. After he left the room a moonbeam came in through the window and tickled Maitlin’s cheek, waking her up. She crawled up the moonbeam, and when she reached the moon she curled up into a little ball and fell back asleep on the moon’s broad face. A little while later her dad came in to check on her, but the bed was empty. He saw the open curtain and understood. He went outside and started up the truck, then he drove it in circles faster and faster until it lifted up off the ground and he drove it all the way to moon, and parked. There on face of the moon he found Maitlin fast asleep. He picked her up carefully, buckled her into her car seat, drove back down to earth, carried her to her bed, and tucked her in. Then he made sure the curtains were closed all the way so that no more moonbeams could come inside. 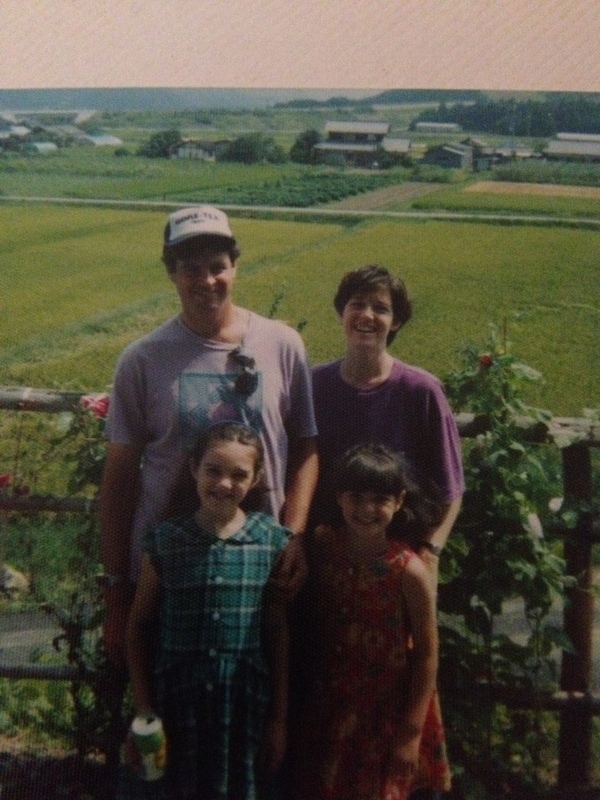 From 1990 to 1997 my family lived in Kobe, Japan. My dad got a job teaching at a branch campus of Edmonds Community College and my mom, my sister and I were all along for the ride. My experience of Kobe was very different from his. 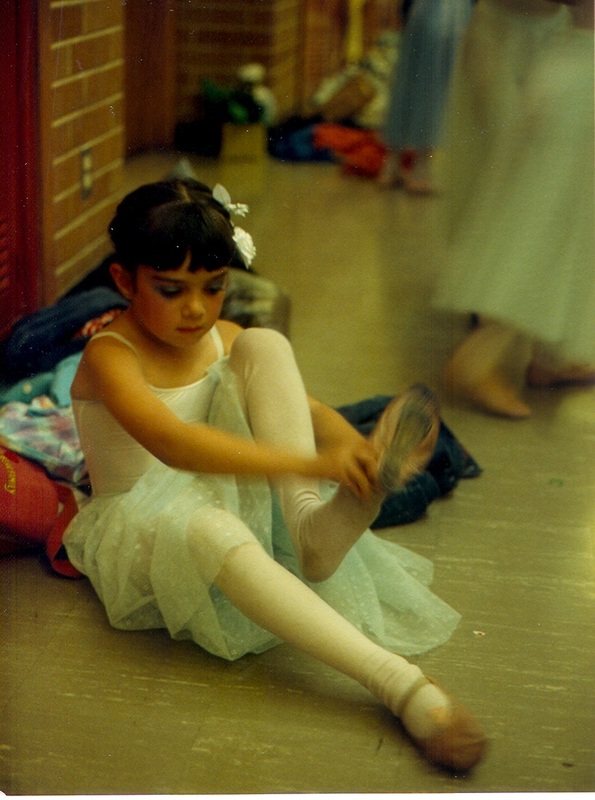 I was a dreamy eight year old, rather indignant at being moved in the middle of the school year to a country where no one could pronounce my name. “It’s hard for Japanese people to make those sounds.” My dad explained. “CAITlin. CAITlin. What’s so hard about it?” I crankily replied. I eventually came to terms with being called “Ke-to-rin”, I took karate and tea ceremony and came to enjoy many parts of my Kobe years, all though I held on fiercely to my American identity, and I never got used to being told by adults what a fantastic experience I was being given and how they hoped I appreciated it. 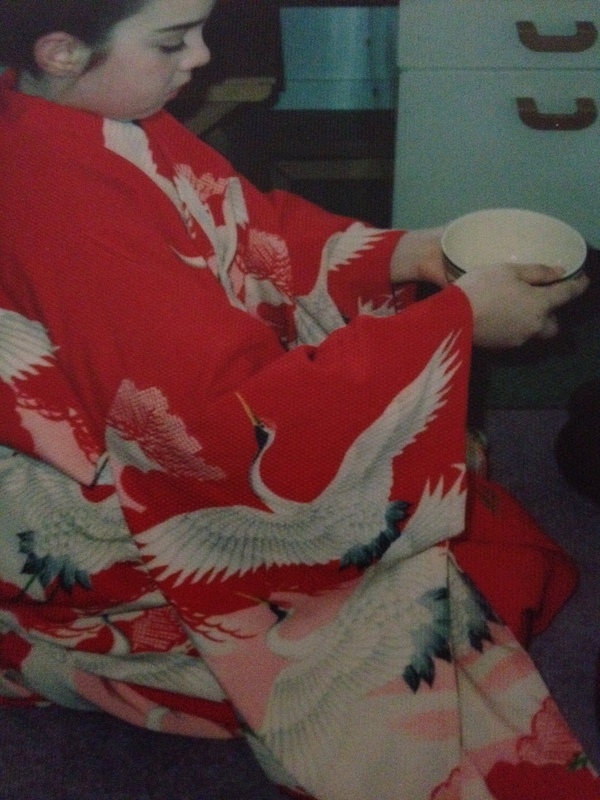 My dad, on the other hand, loved Japan and threw himself wholeheartedly into learning the language and culture. He made kanji cards on little one ring binders and carried them around everywhere, constantly quizzing himself. He learned the art of wearing a business suit, he made friends with the Japanese staff at the college, played tennis and sang karaoke with them at a little bar called Licky Tomato. Not all the American staff at the college were as enamored with the country or as dedicated and hardworking as he was, so he was promoted quickly. During the later years he was Dean of Students and on the front lines of dealing with the corruption and mismanagement the branch campus faced from both its American president back home, and its Japanese sponsor. I was largely unaware of all the problems the campus faced at the time, but I could tell how stressed my dad was. As a child I only heard whispers, the fact that the president of Edmonds back in the states had been indicted, the struggle to get a new sponsor in Japan who was actually interested in running a college, rather than a front for his political campaigns. As a child I enjoyed playing in the large stone foyer of the campus, or watching videos in the library, both largely empty of actually community college students. What little I do know about what went on during the Kobe years I know from Dad’s play. 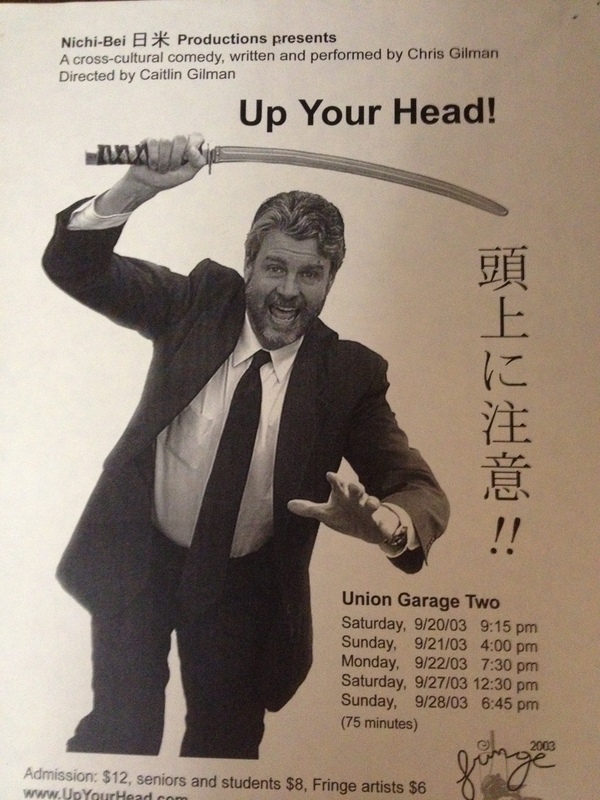 After we left Kobe for Tokyo my dad started writing a novel about the experience, and after we returned to Seattle and after the divorce, he took a class in solo performance, and adapted the themes of the novel into a solo show called Up Your Head! He performed Up Your Head! in the Seattle Fringe Festival back in 2003 and I ended up directing it, one of my few directorial attempts and one of my favorite memories of us working together. The poster for Up Your Head! The play was constructed as a series of monologues. The main character, Marcus, was an American ex-pat working at a Japanese branch campus, there was a Japanese love interest which whom he had theological discussions by way of courtship, there were monologues about the no mixing rule of eastern and western cultural elements within Japan “Sashimi is delicious, don’t eat it with bread”, about Funny English “There is a Japanese baseball team whose slogan is Hit, Foot, Get”, there was the thinly veiled story of the failed campus, and bookending the whole thing, was Sugiyama. I don’t know if Sugiyama was based on a real person, or just a good story he’d been told back in Japan. I was thinking about blocking, set designs, which songs should go with which scene breaks, so I didn’t think to press him for details about the source material, I just wanted to put on a good show. It’s one of many things I’ll never get to ask him now. For all that we shared, for all the advice he imparted and superstitions he instilled and personal history he spun into entertaining tales, there are corresponding losses. Big events in my life he will never be a part of, decisions I’ll have to make without his input, and the facts and fictions of even our shared personal history that will forever he left unsorted. 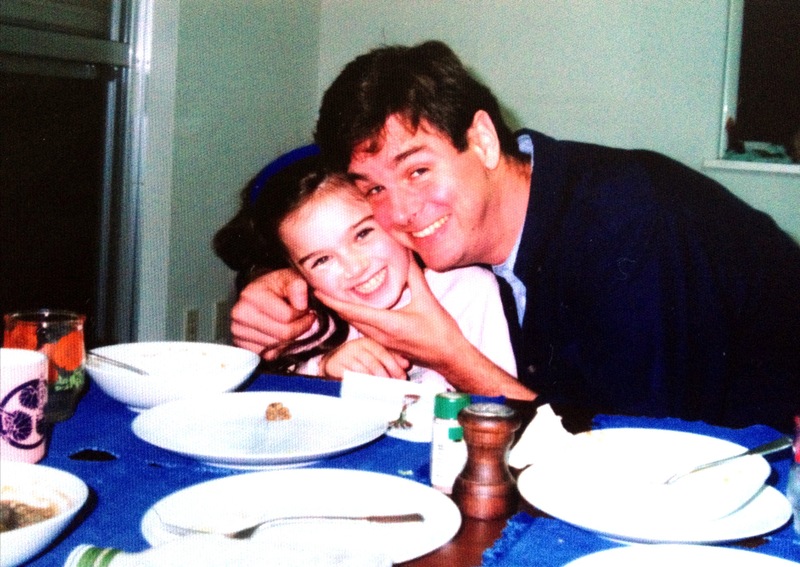 This story is adapted from the script my dad’s solo show UP YOUR HEAD! I have condensed it a little and left out a lot of the Japanese/English doubling that worked much better in performance than it does written. Japan is a country of ritualized speech. You come to work in the morning and say “Ohayou gozaimasu!”(good morning) and you will always be answered back “Ohayou gozaimasu.” When you leave the office, “Saki ni shitsurei shimasu..” (excuse me while I leave before you) the answer: “O tsukaresama deshita” (Thank you for your hard work). It never changes, and it you’re smart, you can use the ritual as a kind of protection. “Ehhh, Kato-san, give him the box!” And they present Sugiyama with the box containing all his possessions, which he accepts like a prize. “Arigatou gozaimasu, I now return to my post. Excuse me.” And he went back and stood in the place where his desk had been until 7pm when he went home. The next day he returned, and the day after that, and they kept paying him, because he hadn’t resigned yet. This went on for six months, and at the end of that time his bosses offered him a years pay with bonuses JUST to go away, and Sugiyama graciously accepted. 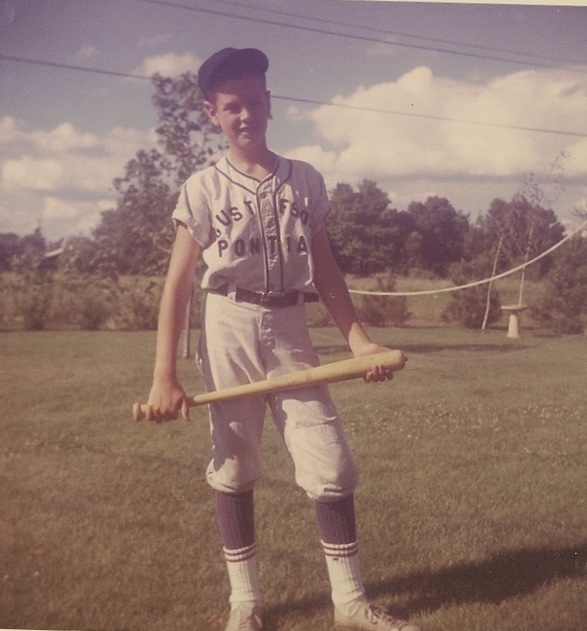 My dad, back in his little league days. My dad loved baseball. Not in any sort of obnoxious way, but his appreciation for the game always been a factor in my life. He watched the other sports, followed football, played tennis as an adult, and he got pretty excited when my sister was playing basketball in high school, but baseball was the one he loved, and I love it too. When I was a little girl we would sometimes play catch, or “pepper” as he called one-sided batting practice. He would pitch me the ball and I would try to connect a bat to it, striking out as often as I made contact. He showed me how hitting a baseball involved so much more than your arms. “Feet, hips, swing” he’d say. You step into it first, turn your hips, and the arms and bat are the last to complete the arc. 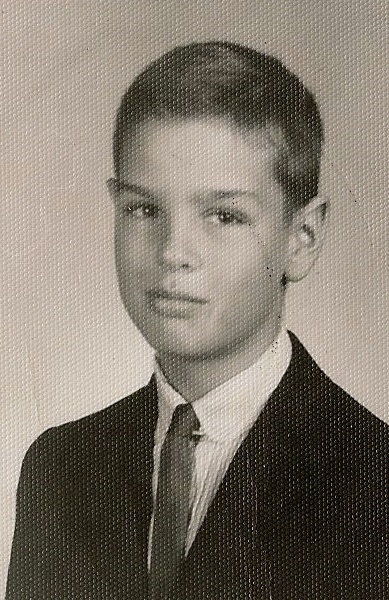 He’d played little league as a boy, been a pretty good left-handed pitcher, even throwing one no-hitter. I sometimes wonder if I would have played softball had we been living in the states. It’s possible, but I doubt it. I was a terrible athlete. Still I grew up loving baseball. When we lived in Kobe, my dad would take my sister and I to watch the Orix Blue Wave, and their star player: Ichiro Suzuki. Baseball in Japan is a lot more ritualized than it is in the States. The cheering is orchestrated, adorable bento boxes take the place of hot dogs and garlic fries, but there is the same electricity to watching the game played live. 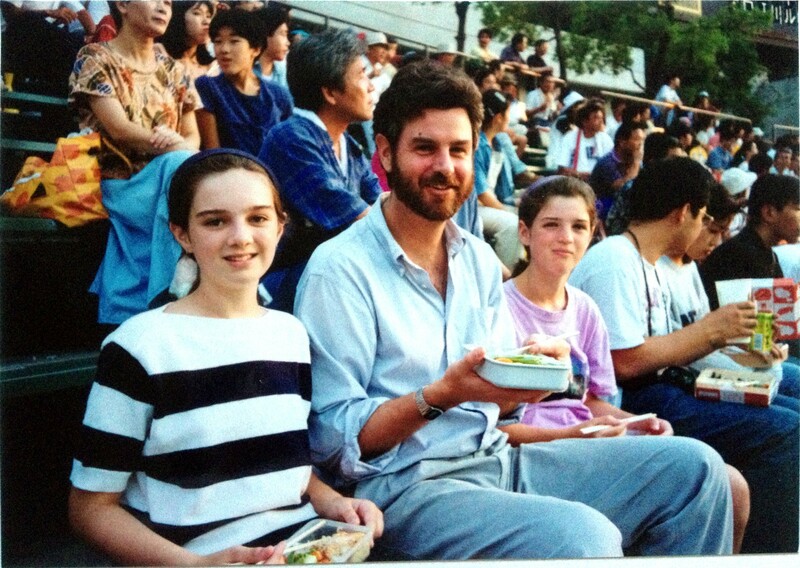 Me, my dad, and my sister at an Orix Blue Wave game. When I moved back to Seattle in fall of 2000 Ichiro moved with me, or so I like to think. He was acquired by the Mariners that year and played in their history making 116 win season in 2001. Socks pulled up, constantly stretching out in right field and almost always beating the throw to first base, he stuck with the team a lot longer than he probably should have, once that epic winning season turned into over a decade of playoff hopes evaporating in July. I was sad when he transferred to the Yankees, but not too sad. I felt I understood his motives. Ichiro was a great ballplayer. He was nearing the end of his career and wanted to end it with a team that had a chance of making the postseason. The irony of the fact that the Yankees have not made the playoffs since he joined them is not lost on me. Several years before he got sick, my sister and I started taking our dad to the Father’s Day Mariners Game. The M’s almost always played at home that Sunday, and we would find the best tickets we could and experiment with different modes of transportation to Safeco Field. The first year we drove, the next took the bus, and the next the train from Edmonds. One year we invited our stepmother along with us and she bought everyone fish and chips during the third inning. 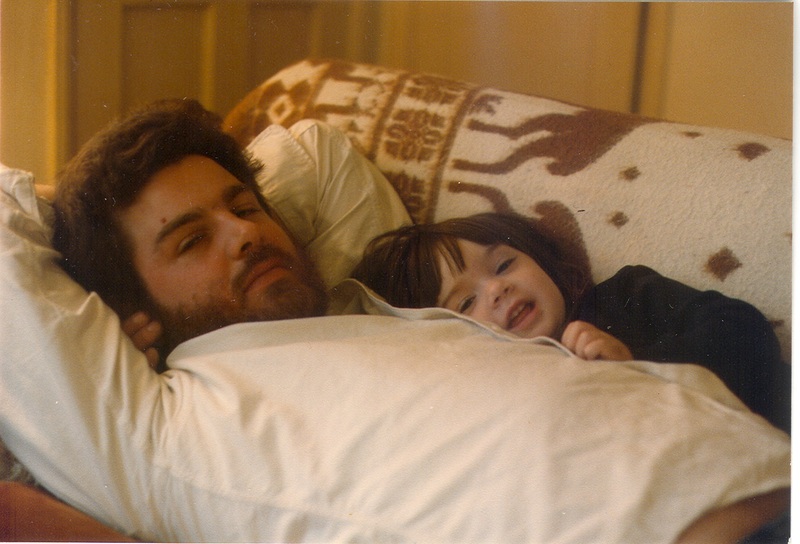 Games were too taxing and time-consuming after the cancer so the last two Father’s Days we had brunch, and went to see movies or got Chinese foot massages. It was always a good time, but I missed going to the game. I missed having that live collective experience, the three of us suddenly on our feet after a big hit, or my dad remarking on the speed of a pitch, on whether a batter was ahead or behind in the count. “This is a batter’s pitch” he’d explain on a 3 and 1 count, or “look at the pitch count on this guy, sometimes a batter will try to foul off pitches just to wear out the pitcher and get his pitch count up.” I think Ichiro was good at that. It feels wrong that I can’t just call him up anymore. Leave him messages like I did after the Red Sox won the World Series last year. Let him know it looks like he was on the money about Justin Smoak. Commiserate about the M’s recent meltdown, and marvel that the last games of the season still matter. But all I can do is wear his hat, the one with the two red socks on it, and sit in the car after I’ve arrived home to listen through the end of the inning. My dad told amazing stories. I would say he was the best storyteller I knew, except that is what my dad said about my grandfather, his dad, and I knew my grandfather so I defer to his judgment. Regardless of which one of them was superior, they both told amazing stories, they would get animated, add in arm movements, gritted teeth, voices that always seemed to be necessary, not put on. You would get swept up in the experience, you would laugh, always laugh, and the point, if there was one, would be forgotten in the course of the storytelling. It was the journey that mattered, it was the communion. His fight with cancer was much shorter than my Grandfather’s. 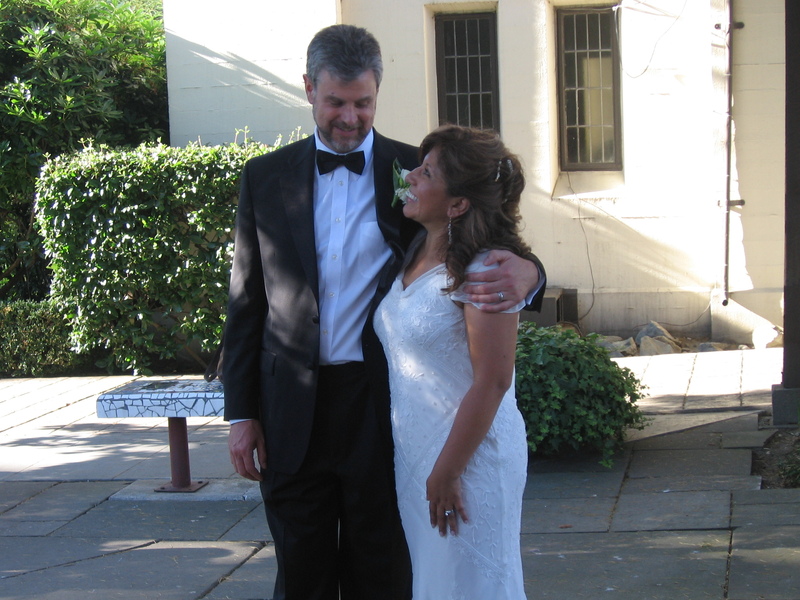 He had a seizure two months after my little sister’s wedding, was diagnosed with stage four brain cancer, and lived another twenty months, six months longer than the prognosis. And they were good months, he shared that with his dad, living with cancer he was still a vibrant, dynamic man. He continued working, he continued traveling, he cracked up all the nurses. He got a fedora for festive occasions, but still mostly wore his Boston Red Sox baseball hats. He took more naps than before the cancer, took longer to do things, sometimes he’d forget to shut doors, sometime his speech would slur, especially if he was tired, but he never lost himself, and he never lost track of who he was and who he loved. 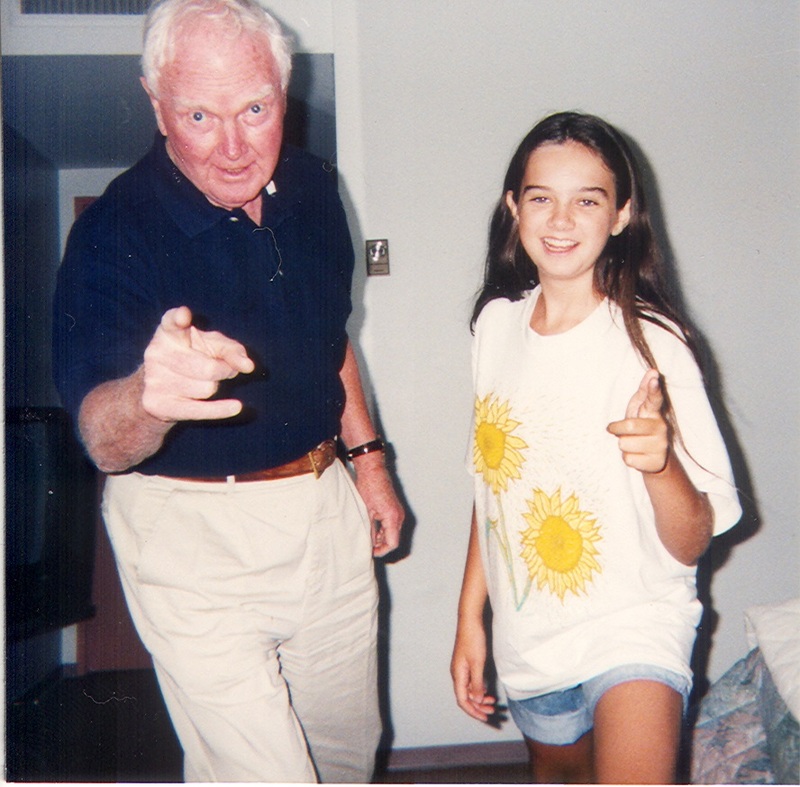 My father and I shared a love of writing, of language and of communication. We shared an ability to observe situations and interpret them, the way people behaved, the reasons we didn’t like certain things even though they seemed friendly or harmless on the surface. We shared a deep appreciation of history and rituals. I will never be the storyteller he was, I don’t have the same gifts for animation, and I’ll never be the storyteller my grandfather was, even my dad couldn’t do that. My grandfather was an extrovert, so where engaging a live audience was concerned he will always hold the advantage. 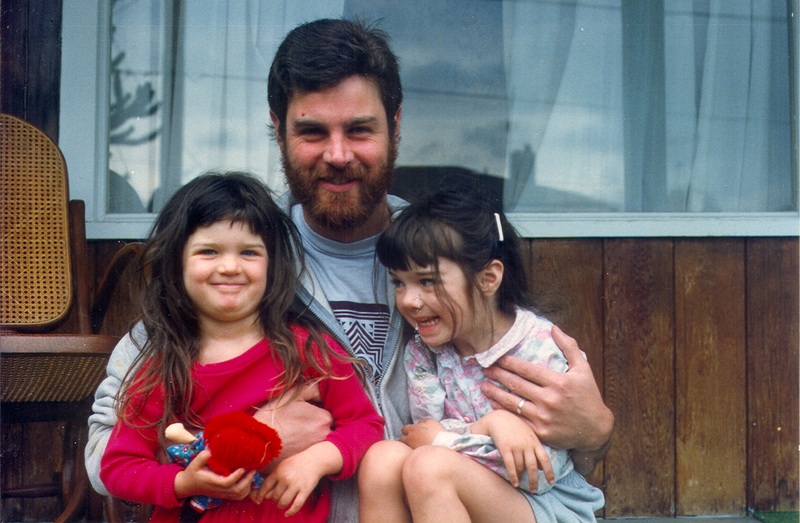 My dad was an introvert, as I am. But like him I feel called to carry on my family legacy. We have always been a family of readers, of philosophers, of storytellers, a family without much talent for the hard sciences, but with an understanding of the unique power of language. He left me with a lot of stories to tell. This is the story my dad told at my grandfather’s memorial and credits with being the first story his father told him, I remember it was one of the first ones he told me and my sister as well. One winter my grandparents went skiing. They were a young couple and they skied all day until the sunset. On his last run down the slope my grandfather fell, wiped out right by a tree. He got up and finished the run. Then he and my grandmother headed for the car, but when they got there the keys were missing. They looked everywhere, in all their pockets, under the car, by now it was getting quite dark and they were faced with the fact the keys must have fallen out sometime during the day, somewhere on the slope. 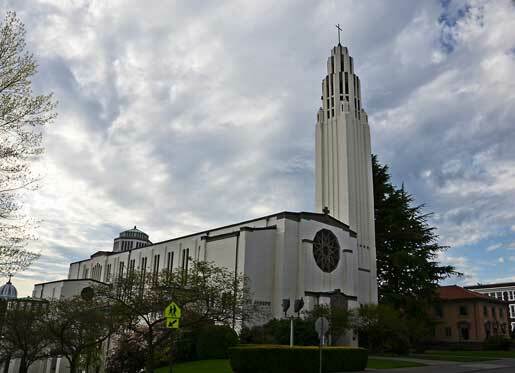 In a Hail Mary attempt my grandfather went back to the top of the slope and tried to go down slowly, peering into the dusk, hoping against hope to catch a glint of metal. As he was making a turn he wiped out again, and looking up noticed the same tree he’d fallen by earlier, and then on the ground, not yet covered by the new snow that had begun to fall, he saw his keys.